As students and parents prepare for back-to school-season, CMHA Sault Ste. Marie is reminding people to keep mental health in mind during the transition. Take care of your body. Mental and physical health are fundamentally linked. Make sure to get enough sleep, drink water, and eat well. Build resiliency. Resiliency means coping well with problems, stress, and other difficult situations. Problems and stress are a normal part of life. Set aside time to think about the resiliency tools available to you, such as structured problem-solving skills or people who can help you during difficult situations. Reach out for support. Social support is an important part of mental health. People in our networks can offer emotional support, practical help, and alternate points of view. Contact CMHA Sault Ste. Marie for mental health support in your community. CMHA Sault Ste. 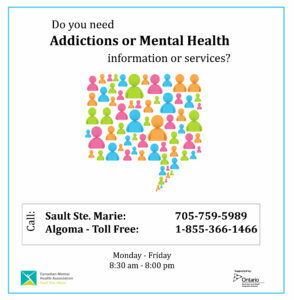 Marie offers the Central Access and Information service, where you can speak with an Access Worker who will be able to provide you with information and referrals to the mental health and addictions services that are available in the Algoma District. Additional mental health tips specifically for children can be found on the Children’s Mental Health Ontario website. For post-secondary students, the Centre for Innovation in Campus Mental Health (CICMH) has compiled an orientation package of campus mental health resources available across the province. Visit the CICMH website to view the full list.